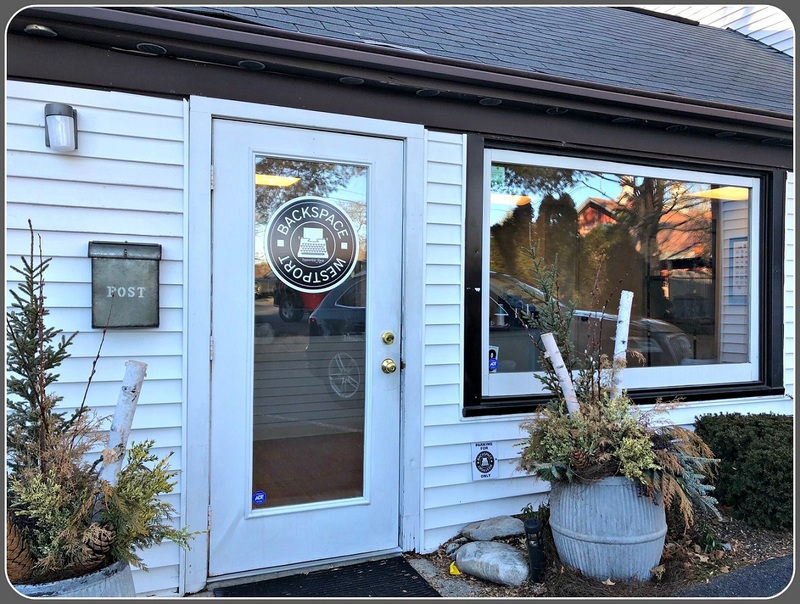 This entry was posted in Local business, People and tagged Backspace Westport, Karin Kessler, typewriters. Bookmark the permalink. I’ve an Olivetti Lettera, that I love. Also, I have a Remington, that has been patiently waiting for me to repair (broken drawband). Every once in a while I think about modifying one or both of them to work as a USB keyboard. That way I could have a digital and a hard copy. I need to come up with a clever way to let the computer know when I want to type a 1, instead of an l.
1 year of 1st year Typing Class and 2 years of 2nd year Typing Class (my parents wanted me to learn to type like the wind) at Staples in the 60’s. I still do “type” like the wind but on my laptop. Had an IBM Selectric into the 1980’s (the machine with the rotating ball). It was replaced by a word processor which was replaced by my First desktop in 1995…never looked back! Still have the Smith-Corona electric that I purchased with some of my bar-mitzvah money in 1965. Taught myself to type with a set of LPs which came with it (vinyl!). Came in very handy decades later when my son had to type out his college applications on actual paper forms! No idea where to get a replacement ribbon the next time I need one. For that transitional moment….Mavis Beacon typing software! I still have an old Remington in the basement and, I think, a Smith Corona, although for some reason it always smelled strange, and bad, when my mother took it out of the case. Karin, I once saw an interview with Tom Hanks. He is a type writer collector. You might wan to contact his representatives,. he probably would be very interested in your collection . Hi…I have written to Tom four times. He does not give email address, only a physical one. Wants people to actually take the time to write a letter. I have typed him 4 letters so far. Not so easy because I am not the best typist. However, there was a big improvement from my first letter and fourth. I think he will respond when he actually receives one – don’t know who passes along mail. In his movie California Typewriters (on Amazon) he says he would respond if someone typed him a letter. We will see! This reminds me of Nina Bentley’s amazing exhibit of typewriter art that was on display last year. And I was just about to discard an old typewriter! Karin, this is such a great idea! There is something about a typewriter that echos productivity, creativity and love for the written word. Of note: my mother just finished writing a book about victorian poems. She thought it best to write it on a beautiful Royal typewriter from the early 1900’s. 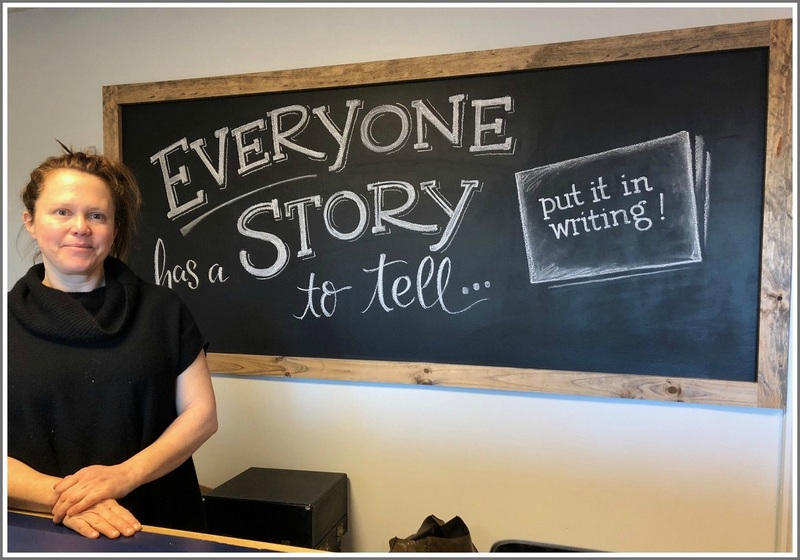 I am hoping to have the community put down their devices and focus on what they want to put in writing without distraction. No spell check or automatic finishing of words. It feels very therapeutic to me to focus on just one task and lose yourself in it, if only for 30 minutes. Karin, What a “novel” idea! Best of Luck. If you type the word TYPEWRITER the letters are all on the top line. This is a bit of trivia I picked up years ago. When a typewriter salesman made his sales call he could demonstrate using this example. I love typewriters! Does anyone do this for vintage Singer sewing machines? I found a lovely early electric singer with Art Deco gold scrollwork…at the dump! I remember being annoyed with my Mom for trading in her beautiful vintage Singer for a deal on a new one! The retail store, Allsaints Spitalfields creates “walls” of vintage sewing machines for their retail store’s windows. Although not for sale or use, it is very interesting and beautiful. There was a time in my young life when I found myself taking parallel lessons: typing lessons at school and piano lessons after school.. Typing lessons concluded; piano lessons continued but it was too late. One wants to strike chords on one instrument but not the other. I never got either one right. I thought Karin Kessler might find this information about an exhibit now showing in the Perez Miami Museum of Art suggestive for anotherway she could fill her space! In the 1990’s I opened my first Tealuxe at Zero Brattle Street in Harvard Square. I had a collection of very old but operable typewriters and always had one or two on a counter or table loaded with fresh paper and ribbons every morning. What was left on the paper at the end of everyday ranged from the filthy bathroom humor to the most creative prose… and every now and then one of our more famous tea drinkers would pound out a paragraph or two. Some of them were incredible and many remarked that it was the machine itself that inspired them to write it. Since you said “my first” Tealuxe, I have to ask: do you own – or still own – the Tealuxe that’s located in Providence RI? I sold a majority to a VC firm in 2001, but yes that was one of our stores. We had quite a few stores but they… well you know. Years ago my boyfriend and I stopped into the Tealuxe in Providence on a cold Saturday afternoon in February. While having a cup of tea and enjoying our conversation, it dawned on me that this was the man I was meant to marry. Since it seemed like a rather significant revelation, I slipped one of the Tealuxe paper coasters into my pocket to remember where I was “the minute I knew”. April 2nd will be our 13th wedding anniversary and the paper coaster still sits in a little frame on the mantel of my fireplace. Thanks for spurring one of my fondest memories. I love this… Every now and then I get a note from someone that had a special moment in a Tealuxe or from someone that worked there as a Teatender during college. It makes me very happy. Congratulations and let me wish you an early Happy Anniversary. Each month I am going to try and feature writing contests around the country. April is National Poetry Month…we’ll see what is out there. On the other end of the spectrum people can come in and write some ‘hate mail’ and then throw it away and not worry about hitting send! Curious to see what people want to write, even more curious to watch people without their electronic devices…thirty minutes may be too long! One semester, when I had to compose poetry for a class, I found I could not use a word processor or a typewriter, either, I guess. I had to use a pencil and paper. I could not achieve the mechanics of a poem using a machine. The tactile experience of pencil and paper was an important part of the creative experience. No such problem with prose. Enjoy the ‘hate mail’ some of it is hilarious. 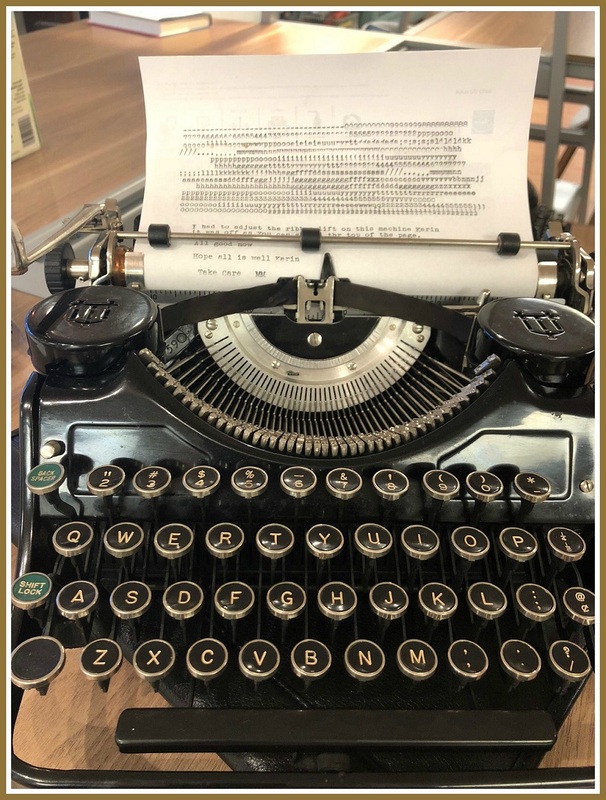 Start a bog and publish photos of the missives… A limerick about a girl from Nantucket looks even funnier in a typewriter font. Loved my Mom’s portable Smith Corona in a fancy tan zippered case. She would type out the pages of her children’s books. While I loved them, sadly, she received many typed publisher rejection notices ! There’s a great new book, “Typewriters: iconic machines from the golden age of mechanical writing ” by Anthony Casillo, foreword by Tom Hanks. p.s. While it’s impossible to pick a favorite, I’d love to find a Keaton Music Typewriter (1953). Original price was $255; today, $4,000+. After I graduated from Staples, in 1954 I enlisted in the Navy and was trained as a radio operator. I learned Morse code via head phones and typed the words on to a “Telegraphic” typewriter — all CAPITALS and with a line through the Zero numeral. Fast forward to 2014, and Portland, Oregon: I joined up with a nonprofit group in Portland that is restoring a World War II amphibious landing ship. The radio room had no TELEGRAPHIC typewriter, so I set out find one. I searched typewriter museums all over the country. All I got back was “Sorry, none here. 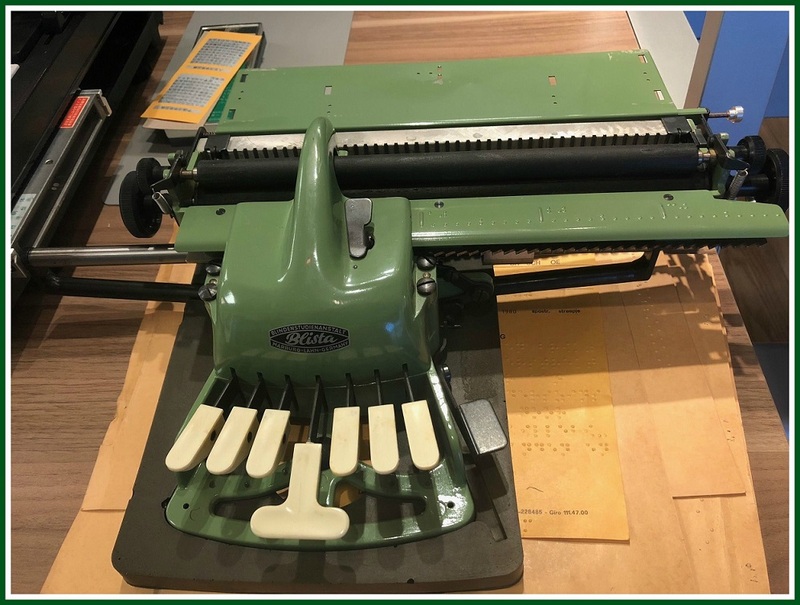 Best of Luck.” Then, a typewriter repair shop in town called me: “Yes, we have two TELEGRAPHIC mills.” The shop owner’s father –still alive in his 90s — had been a navy radio operator in WW2. He was at the shop that day, and we talked radio-shack talk from back in the day. Upshot: the shop donated one of the “mills” to the ship. Whenever I visit the LCI-713 at its moorage in Portland’s Swan Island Lagoon, I’ll go into the radio “shack,” put on headphones and listen to Morse code — yes, it’s still being used in certain applications. So cool…I love it, I get it! This has been my issue, I love all of the typewriters that I have collected, they are all unique. I found a graphotype and I am considering buying it. It weighs ~500 pounds! What a great story. I graduated Staples in 1972. Not sure if was an elective but I took Francis Gilmore’s typing class. To this day it among the most important skills I have learned. I am sure there are other parts of my high school curriculum that have served me……but none more than the ability to type. I am good for 65-words a minute as a touch typer and in this computerized world basically a must have ability. My dad was a raging hunter and pecker with his index fingers, effective but maniacal to watch in a very entertaining way! P.S. I miss my IBM selectric! Come to the shop…I have a few Selectric’s! Thinking about having a typing contest at some point. I think people are either really good or ‘hunter’s and pecker’s. Just got our 1950’s sea-foam green Hermes 2000 restored to full operation. It’s a small wonder of precision and mid-century optimism. Great story. Congrats to Karen Kessler! After viewing “California Typewriters”, I pulled out the typewriter that my parents gave me when I graduated from Staples in 1969, a “Cutlass” from Sears. Far from being a collectible, but it has inspired a weekly paragraph or two of random fiction for fun. (The last time that I formally used it was to fill out a grant application in 1998…got the grant!) 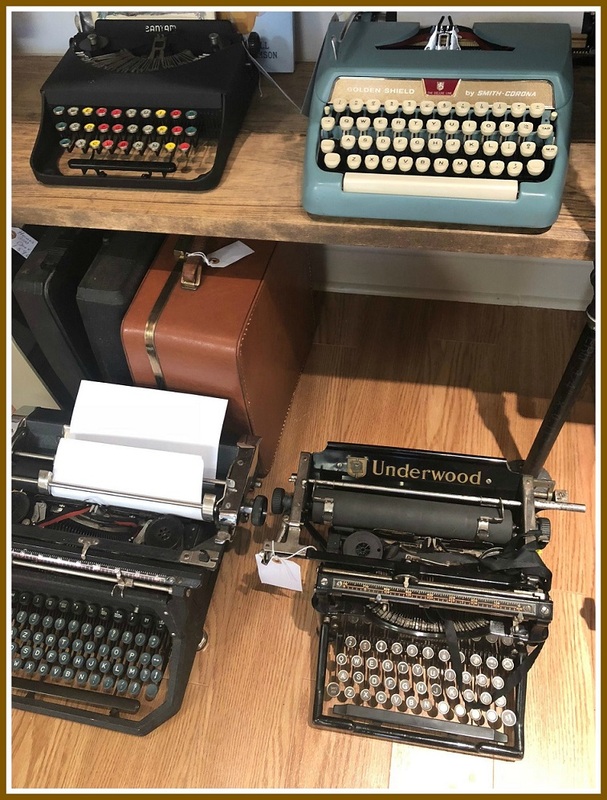 My wife, Susan, is the Development Director of the Vigo County Historical Museum here in Terre Haute, Indiana, and she has just finished putting together an exhibit of the museum’s collection of typewriters. The collection includes some sweet old timers from the 1880s, possibly made back in Connecticut! There will be photos soon at http://www.vchsmuseum.org. Thanks! My mother had a very heavy black typewriter. Wish I knew what brand it was… I used it to type papers until she upgraded to an electric one. Can’t wait to stop by Backspace. So sorry I’m reading this just hours after your opening! Would have loved to be there! I am working on setting up local repair services. Will keep you posted. I don’t repair, only carry ribbon. Wonderful idea Karen and best of luck with the store! I used to pick up old typewriters at tag sales, etc. and never paid more than $25-30 for each – several of my 15 or so now wonderfully scattered around our house as decoration and great conversation pieces. I suppose the days of cheap purchases are gone now…. When I started working in New Haven about 6 years ago I heard stories about the legend of Manson Whitlock and his 2nd floor walkup typewriter repair shop on York Street downtown; well into his 90s and still driving to the shop, open on scattered mornings when he was up to it. One summer day in 2013 I bravely carried my favorite massive Underwood 11 and portable Corona 4 (plus pics of my others, like a proud father) up the stairs only to find it closed. Shortly thereafter I read that he passed away at age 96, so I missed my brush with greatness. Glad to know there are others out there like you (and Tom Hanks) who are just my type (sorry) and see the value of these iconic machines.